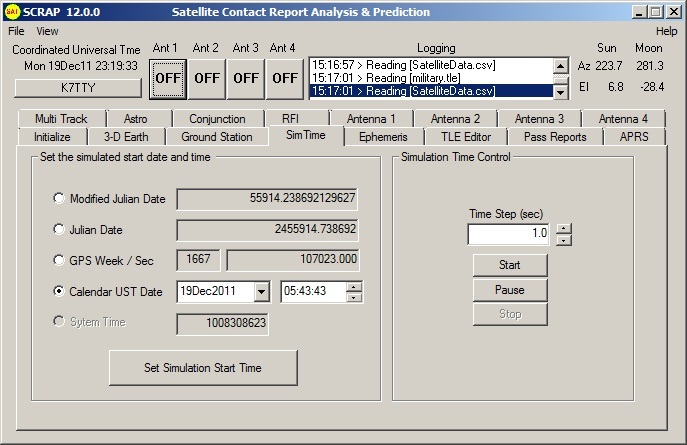 Satellite Contact Report Analysis & Prediction (SCRAP) is a tracking, report, analysis, prediction and 3-D real time display program. 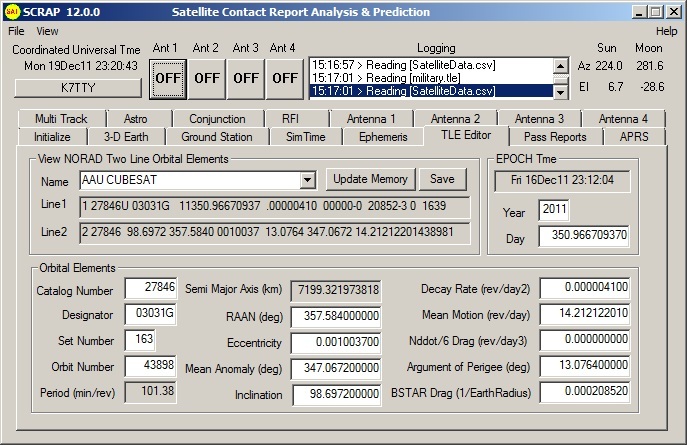 It tracks and predicts passes of satellites based on the geographical location of the ground station, the current date and time and Keplerian orbital data for the satellites of interest to the ground station. The minimum recommended platform is Windows 98 or better running a Pentium Processor 500 MHz or greater, 256 Mbytes RAM and a graphics accelerator card with OpenGL support. Of course it helps to have at least 1024x768 resolution. SCRAP has been recently updated to give it better performance and added features. AMSAT Journal Nov-Dec 2003 and again in Jan-Feb 2006 . 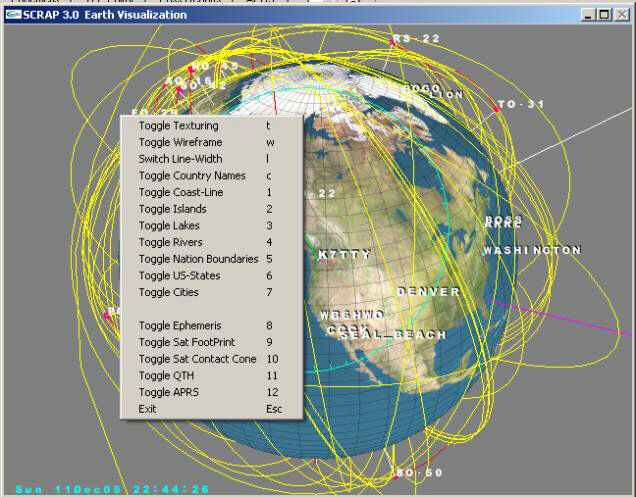 In addition to the satellites, it provides ground labeling for over 260 countries and 2265 cities. The user is able to pick from up to 27 different map textures, and apply islands, lakes, rivers, US states, coastal lines and national boundaries lines. SCRAP Support - When the software is updated, your old PASS KEY will still work. Software updates (fixes) and frequently asked questions can be found on the support page. Link to YouTube video showing an introduction to SCRAP and all of it's windows. Download the software and install it on your computer. Initially it functions in the TRIAL mode. Everything will work with the exception that you will not be able to download recent Two Line Orbital Elements (TLE). Currently the license PASS KEY is only being provided to federally licensed amateur radio operators for non-commercial personal use. The TRIAL mode gives you the opportunity to check out the product. 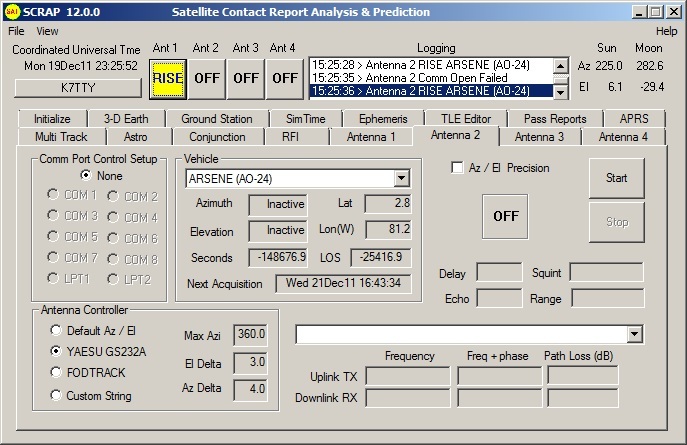 After you have played with the software and find it suitable for your needs, you must acquire the PASS KEY that will unlock the capability to download recent ephemeris data (TLE) from the internet using the software. Send email to BSDL. We receive your email and email you the PASS KEY which unlocks the software. I verify to my best ability that you are a licensed amateur radio operator and that the end application is not for business or commercial use. Sim Time Define a simulation and step time other than current UST time. TLE Editor View and edit the decoded TLE parameter in classic Orbital Elements. 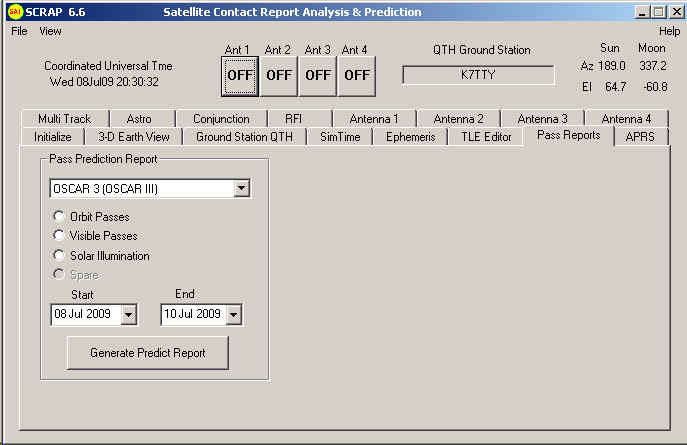 Pass Reports Produce predicted orbit pass reports, visible passes and solar illuminations. APRS Download APRS stations via Internet. Locations can be used for prediction and display. Antenna Az/El rotor control for up to four rotators. Astrodynamics Calculate position of the planets. SCRAP is not for the underpowered computer. 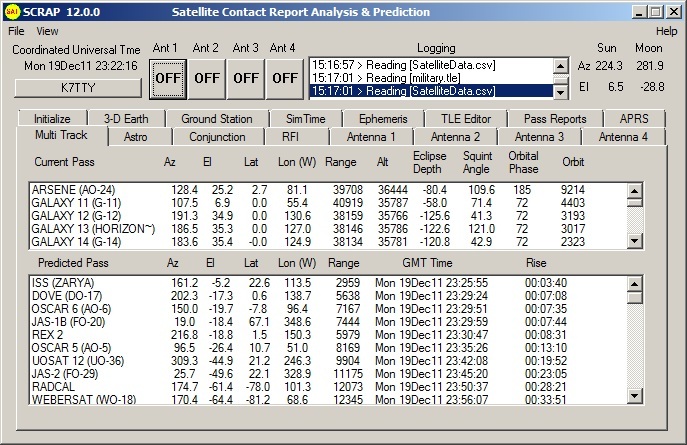 In order to propagate ephemeris for each of the satellites it displays and reports on, it performs millions of floating-point calculations every second. Therefore, the minimum recommended platform is Windows 98 or better running a Pentium Processor 500 MHz or greater, 256 Mbytes RAM and a graphics accelerator card with OpenGL support. Of course it helps to have at least 1024x768 resolution. SCRAP is distributed using the Windows installer software (.MSI file) and has all of the directory information and files needed for a basic startup of the program. To extract the files, download the WinZip and save it to your computer. Unzip and execute the "Setup.exe" file. This will create a startup icon on your desktop. SCRAP does not access the Windows registry except to install and remove the product or place any hidden files on your system. It does have TCP/IP code for downloading TLE and APRS data from the Internet. The main window displays the status of each of the four antenna controllers, GMT time, QTH ground station, Sun and Moon positions. There is also a File option and View option. The View option provides the ability to open up some of the windows as a separate child popup. SCRAP opens with an initialization page as shown. The top left window is used to load Two Line Orbital Element files into the application. 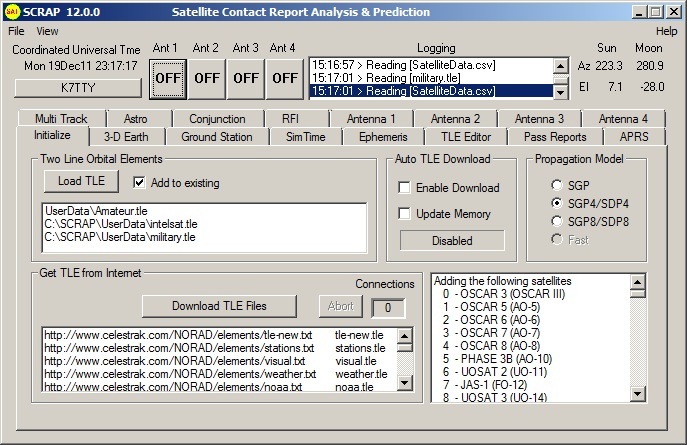 Pressing the Load TLE button brings up a file box allowing you to load any one of a number of satellite TLE files. Checking the Add button allows you to keep the existing selection and add additional satellites to the application. TLE data is downloaded using a pre-built script file. Pressing the download button initiates TCP/IP connections to the TLE source, and in a matter of a minute or so, you have downloaded the latest files set. From the Earth View panel you can select the Earth orthographic projection of your choice. Your selection is then loaded into SCRAP and the Earth is displayed in its own window. On slower computers this may take several seconds. The check boxes allow you to select display attributes on the Earth display. The View Point and Latitude/Longitude Offset allows you to select from a number of options for choosing your viewpoint. If you select a satellite, you are positioned above the satellite and the Earth rotates under your location. The Earth-Simulation 3-D model displays a selected Earth map texture overlaid on the globe. You can rotate the Earth, zoom-in, etc. using the mouse and control key. Map textures of the Earth can be changed at any time during the run. The original PREDICT tool performed all of its predictions based on a user input QTH, Ive modified it so that the user can specify multiple QTH locations. 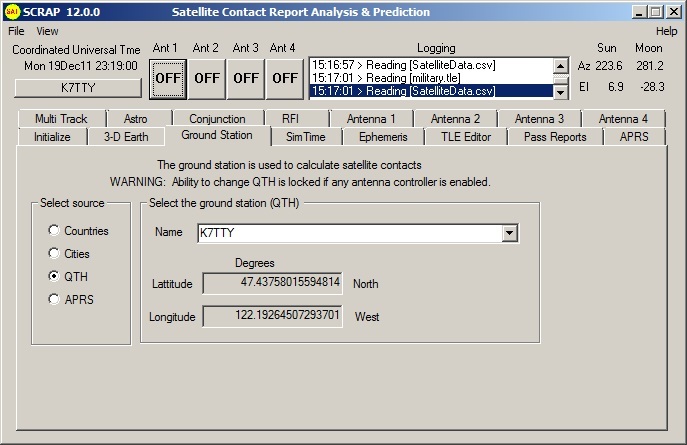 This panel allows you to change the default QTH location to any city, country or QTH of your choice. SCRAP added the capability for the user to assign any country, city, or APRS station to be the new QTH. 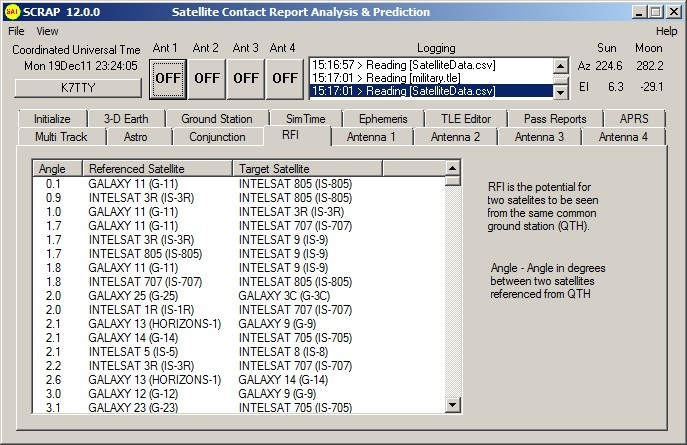 You can easily move from location to location to predict and display satellite contacts for any location. SCRAP provides ground labeling for over 260 countries and 2265 Cities. In addition, the user is able to pick from 27 different map textures, apply island, lake, rivers, US states, coastal lines and national boundaries lines..
No tracking program is complete unless you can input any date time condition and set a fast forward or backwards time step. This panel allows you speed up reality. The ability to control simulated time is provided to allow you to fast forward the simulation to get a perspective in fast motion of what the satellites are doing. You can also set a negative step time and run the simulation in reverse. The various time formats were provided for flexibility in setting up the simulation. All displayed times are in UST (GMT), but the user has the option of specifying times in GPS, MJD, JD or calendar formats. The main ephemeris engine is Dr. T. Kelso's Pascal's SGP, SGP4, SGP8, SDP4 and SDP8 satellite ephemeris propagation routines. These models were borrowed from SPACETRACK REPORT NO. 3, Models for Propagation of NORAD Element Sets, Felix R. Hoots, Ronald L. Roehrich, December 1980. 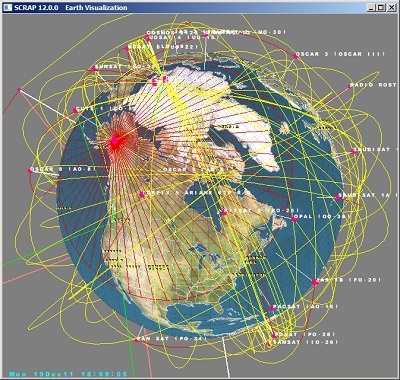 This panel displays the current ephemeris vector data for position and velocity. 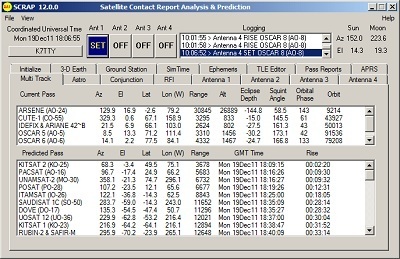 In addition it allows you to switch ephemeris models in real-time. Normally you should never have to leave the SGP4/SDP4 model, but its interesting to switch between the other models and observe the differences. This panel provides you with a tool to view and edit the orbital elements stored within the NASA two line orbital elements. One of the most important fields on this page is the EPOCH Time. If your time is stale, then your vehicle positions will not be accurate. 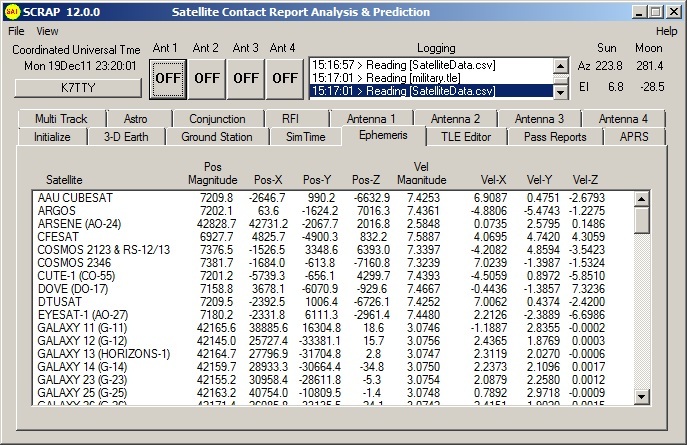 Satellite contacts in the program’s database are calculated at a once/second rate. Separate windows are used to display current passes and upcoming passes. SCRAP also can create text-format reports of predicted passes. 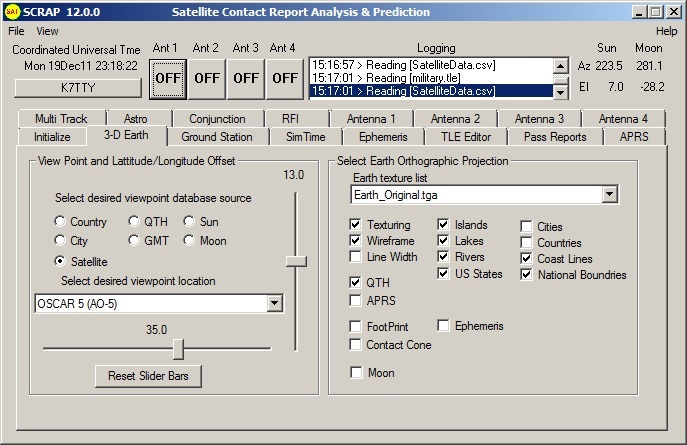 Tracking data is also displayed for satellites in contact range. The name, azimuth heading, elevation, sub-satellite point latitude (in degrees North) and longitude (in degrees West) positions are provided, along with the slant range distance between the satellite and the ground station (in kilometers). 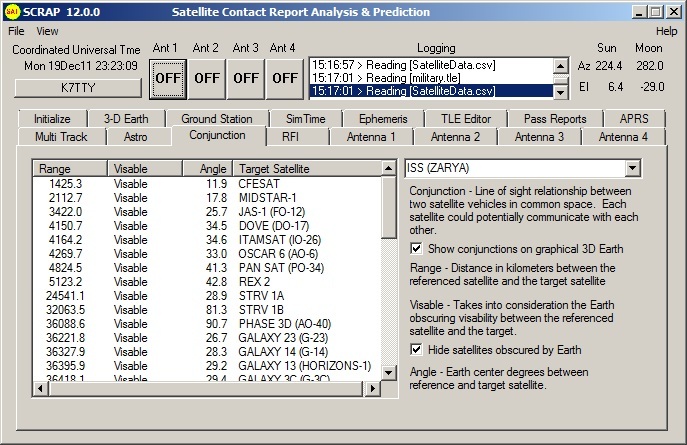 The Visible Passes report option displays the satellites in sunlight where the ground station is under the cover of darkness. Solar illumination prediction report indicates how much sunlight a particular satellite will receive in a 24-hour period. The project takes an interesting twist on this addition. The Automatic Position Reporting System (APRS) developed by Bob Bruninga, WB4APR, is used for tracking and digital communications with mobile GPS equipped stations with two-way radio (ref. http://www.aprs.org). 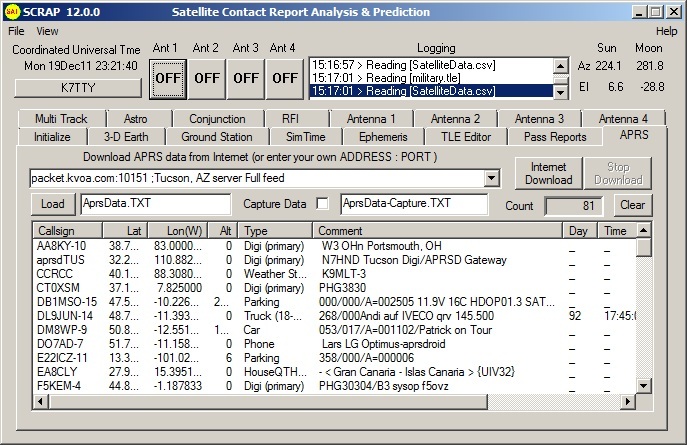 SCRAP provides an Internet access that downloads APRS station information residing on multiple WEB servers as defined by the APRS Protocol published by the Tuscon Amateur Packet Radio Corporation. To use the Internet download feature, select the desired WEB server and press Internet Download. If the counter does not increment, try another server, not all servers in my current list provide the proper protocol. Most servers will never disconnect, so the SCRAP design lets you determine when enough stations have been added to the list. You can go to multiple servers and add more stations as desired. The top window shows the current potential contacts. The bottom display shows the upcoming contacts. Probably the most useful number on this display is the time until rise of the next contact. Satellites are sorted by rise time. A conjunction between satellites occurs when two satellites can be seen by each other. Radio Frequency Interference is possible if two satellites as viewed from the ground station have a low delta angle between them. In the case of an omni directional antenna, it could be possible that two satellites could be communicated with at the same time. Just for fun this page was added using the plan404 ephemeredes developed by Steve Moshier. The planets, sun and moon are also available within the antenna pointing page described next. One application is to allow you to control your antenna for Earth-Moon-Earth comunications or point solar cells at the sun. This antenna feature allows the user to control an azimuth-elevation rotor for a real-time contact for up to 4 simultaneous contacts. Rotor control is provided for the Yaesu GS232A, FODTRACK and the default standard controller interface. Elevation angles are suppressed until the angle rises above zero. 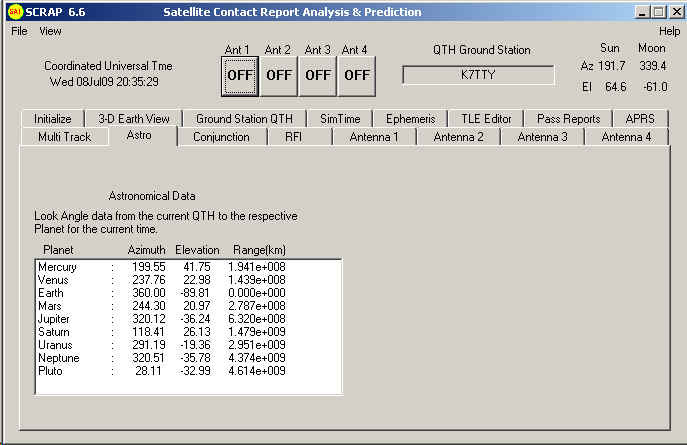 The QTH is selected from the Target QTH panel, and once you start this display, you cannot change the QTH until you stop the action. The precision function allows you to update the rotor with data less than one degree accuracy. Data is sent to the rotor once per second. The Icon will change from an antenna (currently shown), OFF. FADE, RISE or LOS for loss of signal. The Icon is also displayed in the upper section. Use the mouse and it's left-button to rotate earth. Hold down Ctrl before you hit the left mouse button to scale the earth. Right-Click the window to get the options menu. Note that options are controllable by keyboard too. It’s been said that SCRAP can handle up to 2000 satellites. At runtime the default is 500. If you wish to increase the number then include a command line parameter that defines the total number you wish to support, i.e. “c:\SCRAP\Scrap.exe 2000” for 2000 satellites. Just remember that the more satellites you add to the list, the slower the overall application runs. NUM_COUNTRIES There are 267 countries included in the database latitude/longitude. NUM_CITIES A total of 2267 cities are included in the database with latitude/longitude. NUM_QTH You can specify up to 50 unique QTH locations in the user-defined Scrap.INI file. NUM_APRS For some odd reason, included is space for up to 30,000 worldwide APRS stations in the dynamic database.